I missed one picture from yesterday. A boat picture that was on Husband's phone. Lallie hasn't taken a nap in three years.....well, unless we're on the boat! It never fails, she falls asleep in my arms on the way back into the dock from wherever we've been for the day. I mean full on drooling....out....dead asleep to the world! I rather like it as I never get to hold my sweet baby while sleeping anymore. Granny and Grandaddy have been promising Lallie a pony for years (or rather, Lallie has been asking for one). As you know, Husband's parents have a farm so they have plenty of room for animals. Lallie did have a Donkey named Clem, (short for Clementine when we discovered she was actually a HE!) but Clem has "gone out to pasture" and the pony is it's replacement. Lallie named the pony, Cupcake (after much discussion as to why the pony.....and the baby, for that matter, could NOT be called Rapunzel or Flynn Rider). 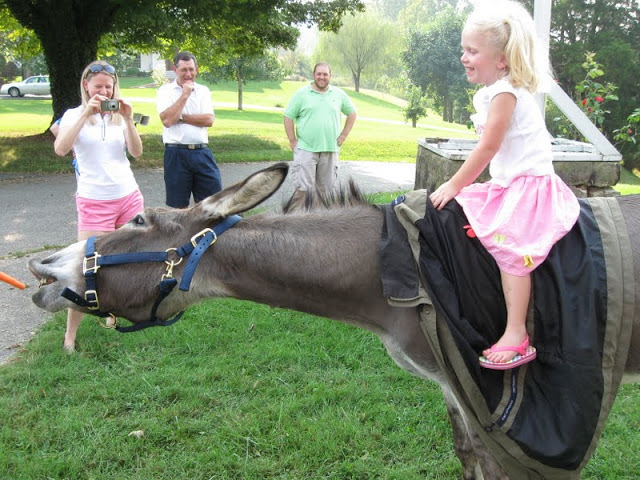 We're pretty sure Cupcake will actually walk when Lallie is riding it unlike Clem the Donkey. Cupcake is 12 years old and is a world champion in some sort of pony competition. The friend that Granny and Grandaddy received the pony from said Lallie can come take a picture with the trophies next time we visit. Yesterday, we had an ultrasound and were able to see Baby SLPS on the big screen for the first time! Lallie was able to join us which made the moment even more special. She loves the baby even more now, kissing my belly multiple times a day and constantly telling us how much she loves her family and writing little notes to express the same. I know it looks just like every other baby ultrasound picture out there, but that doesn't make it any less special for us! All went well with the appointment. 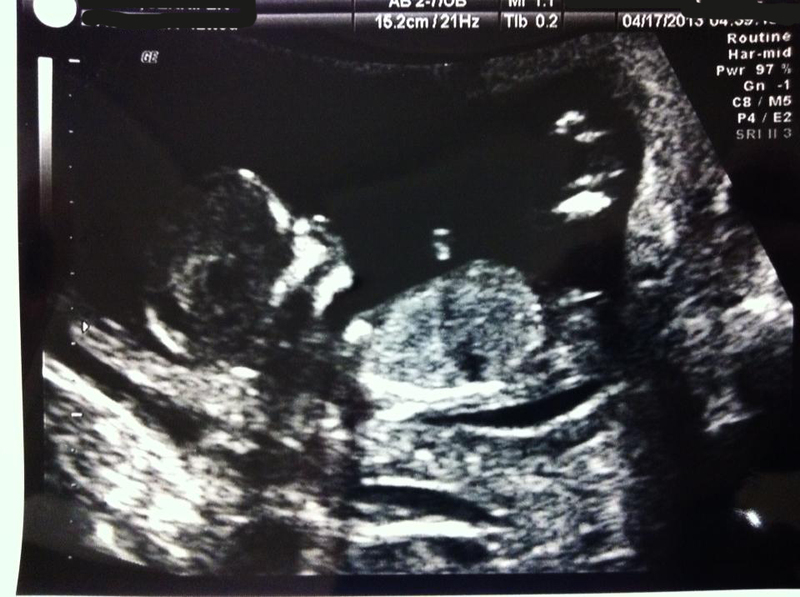 The baby is growing perfectly and was an absolute jumping bean! The baby would barely sit still, waving its hands, kicking its feet, sticking out its tongue and even managed a couple of flips. I'm pretty sure I felt it moving yesterday for this reason but I haven't felt it since. Very soon I'll be feeling it in my ribs daily! After yesterday's Maternity Work OOTD, where I clearly posted that I needed to find a better way to take those pictures, Ashleigh started giving me a hard time (in good fun) about my stance and lack of smiling. 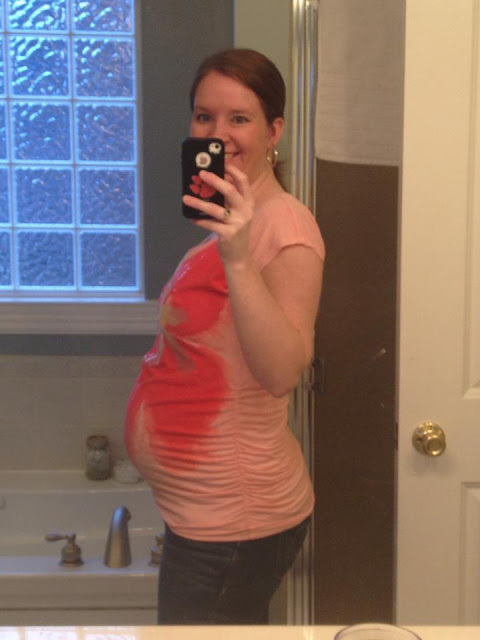 Here's Ashleigh, at 23 weeks, demonstrating how to take a belly shot....with a big smiling face. 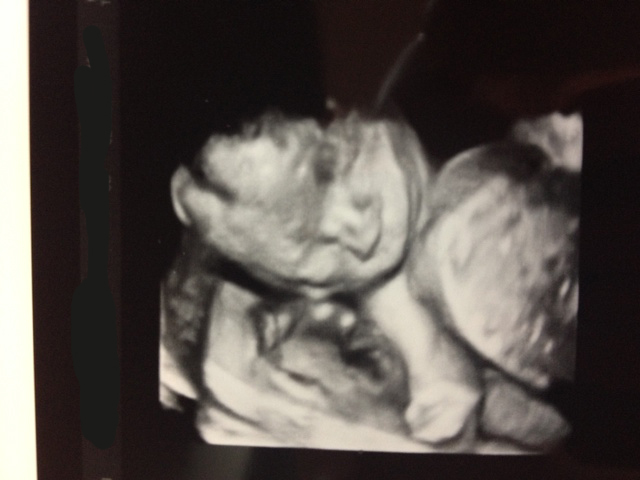 And just for kicks, here's her sweet baby at 23 weeks via 3D (or 4D maybe?) I wonder if Husband and I will have this option?